Nabor's Tree Service Chattanooga is proud to be who Chattanooga calls for tree services, 7 days a week, 365 days a year. Our reviews are outstanding because we guarantee reliable service, quality work, and fair prices. With safety at the forefront, our team of tree experts are ready to take on any job, big or small, thanks to intensive training, years of experience, and the best equipment on the market. Our loyal customers know that they can count on us to be there when they need us, handle their trees with care, and to deliver with complete satisfaction. Safety is always our top priority. As the tree service Chattanooga relies on, we know that for a home or business owner, safety is always a concern. At Nabor's Tree Service Chattanooga, we want you to know that we use only the best equipment, which has been properly maintained and diligently serviced. This ensures the safety of our customers and the safety of our team, especially when performing complicated services. Large jobs require our heaviest equipment, which has the potential to cause damage to your landscape. If you are not comfortable with this, we are happy to tackle those projects using climbing harnesses. As a part of our excellent customer service, we strive to be flexible and accommodating in all matters. We are pleased to offer tree services for a variety of property types. Because we want to protect our customers, our professionals are always licensed, bonded, insured, and provided with workers’ compensation so that you carry zero liability. 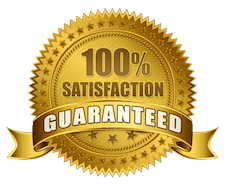 We guarantee 100% customer satisfaction with all of services so you that can rest assured that we will perform each job with the utmost care and efficiency. We do what we say, when we say we’ll do it, and we work hard to earn your business. Search “tree service near me” and give us a call today! At Nabor's Tree Service, all of our employees are licensed, bonded, and insured. It is our promise to protect you from any liability while we are on your property. Further, our team is provided workers’ compensation, in the event of an accident, so that you are never financially responsible. This is only part of what makes us the Chattanooga tree service. Fair prices and the highest quality of work are what you will find when you hire Nabor's Chattanooga. Just like us, our customers work hard for their money and so we guarantee total satisfaction. We will always give you the best price we can because it is you who keeps us going. We are able and willing to perform a multitude of services, of every size and in any situation. We pride ourselves on our top notch service, as well as our attention to detail and our willingness to go above and beyond to make our customers happy. We are pleased to handle every aspect of every job and will leave your property looking more beautiful than before. We know that Chattanooga is a community-oriented city and we are proud to be a Chattanoogan-owned and managed business. We are pleased to be a part of such an incredible town and hope to continue to be your go-to for all tree services. Search “tree service near me” and ask for a free assessment! See our service locations page for all the area around town that we serve. Our team is held to the highest standards, in regards to professionalism in any and all business interactions. Communication, reliability, trustworthiness, and workmanship, are the pillars of a professional tradesman and we require our employees to embody each of them at all times. In our industry, safety is everything. Performing tree care is dangerous work and we demand the safety of our customers and our staff. We only use the best equipment, which has been inspected and serviced regularly. Further, every one of our tree experts has been properly trained to ensure safety on every job. Our tree service equipment is the best on the market and allows us to take on even the most complicated jobs. All of our tools are properly maintained and regularly serviced, in order to ensure the safety of our team and our customers. Similarly, we only hire the best of the best, when it comes to our tree professionals. Everyone we send to tend to your trees has been expertly trained and has the experience necessary to safely and efficiently care for your landscape. We provide our potential customers with same day estimates, as a way to display our professionalism and dedication to their satisfaction. As a home and business owner, we know that tree care is not always a budgeted expense and can be just one of the many unexpected costs of owning property. When jobs are performed without a pre agreed price, it can cause unnecessary stress and apprehension for the customer but at Nabor's Tree, we want your experience to be a smooth and worry-free as possible. Three factors play a role in the cost of a tree removal: location, height, size, and species. The tree’s location can help determine the difficulty of the job. For instance, if your tree is tangled in a power line or falling into a structure, a certified lineman may be required to complete the job. Location also determines how dangerous the service will be and the higher the level of danger, the more the job. The height and diameter of the tree are important because they determine how much work is required to complete the service. A taller, thicker tree will be more costly than a shorter, thinner tree. More work means more manpower, more equipment and, thus, more expense. The tree’s species plays a role in cost, in that softer wood will require less time and labor than a tree of harder wood. ​Four factors go into the pricing of a trimming service including location, size, species, and degree of trimming required/desired. As with tree removal, the tree’s location determines the cost of the service because fewer resources are required to trim a tree that is located away from things, alone in a field, than a tree that is up against the roof of a home or office building. Taller trees require much more climbing and manpower to trim. Similarly, a thicker tree has more total branches and takes longer to trim. The more time and team members a service requires, the more it costs. Some species of trees have larger branches, more limbs, or an awkward shape, which means it will take our team longer to service and use more resources. The cost of trimming can vary greatly, depending on the tree’s species. How much a tree needs to be trimmed or slimmed down can have a big impact on the cost of the job. A tree that only needs a couple of cuts and some light shaping will cost significantly less than one that is severely overgrown. In figuring the price of a stump grinding and removal service, we consider 5 things: whether it needs grinding or removal, location, species, size, and age. Depending on the preference of the customer and the recommendation of our team, a stump can either be removed or ground. Grinding is the most popular route, as it is the more economical of the two and an easier job. Removal involves removing the entirety of the stump, which leaves a gaping hole in the landscape. It is also more expensive than grinding because it is more complicated and time consuming. Regardless, we are pleased to eliminate your stump in whichever way you choose. The stump’s location matters, in that a one that is difficult to reach will be more costly to eliminate. The species of the tree contributes to the price of the stump elimination because a harder wood, such as walnut, is more difficult and time-consuming to grind or remove, than a softer wood like pine. A small stump takes more time and more effort to remove or grind, whereas a smaller one can be a quick and simple job. An older stump involves a larger, more complex root system, which makes a removal services more complicated and expensive. Is the tree a hazard? Is it dying or have too many dead branches? Is it causing a problem? Does it add value to your landscape? These are all questions we ask ourselves before performing a service. Take a minute to answer them, in regards to your tree, and you may find that you already know the answer! If you consider the tree to be dangerous and you and your loved ones go out of your way to avoid it, it may be a hazard in your landscape. If this is the case, it must be determined whether the issue can be solved with a trim or whether it needs to be eliminated. Trimming is always the preferred solution, as a tree should never be removed without good cause, but in some cases, there’s no other option. The health of the tree and everyone’s safety is always top priority, with any service. Is it dying or have too many dead limbs? In the case of a severely damaged tree, it may be visibly diseased or dying and removal may be the most appropriate option. If it is visibly healthy, however, with one or two dead branches, the tree may be mendable with good trimming. Is it causing a problem? If your tree is falling into your home or overgrown and preventing the rest of your landscape from thriving, it may need to be removed. Storm damage to the tree can also be grounds for removal, if the damage is extensive. However, a trimming may do the trick if the tree isn’t causing significant or costly damages. If the tree is the focal point of your landscape and removing it would significantly alter the aesthetic, trimming may be the best route. A regular, professional trimming service for your trees is vital to the beauty of your property and can do wonders. It is common for home or business owners to feel a tree needs to be removed, simply because they cannot picture the results of a trim and mistakenly decide that the tree is beyond repair. That being said, if the tree is definitely causing more harm than good, it may need to be removed. We offer the complete spectrum of tree services our residential and commercial customers demand. From tree removals to emergency 24x7 tree service, we provide complete tree care. Out of all of our tree services, removal is the most utilized. This is likely because it can be a daunting task and one that most home and business owners don’t know much about. When you begin to question the health of one of your trees or wonder whether a tree damaged in a recent storm is beyond repair, it is time to give us a call. It’s not always easy to tell when a tree needs to go simply by looking at it; allow us to assess the tree and give you our expert advice. One of our tree professionals will happily come out to your home or business to assess your tree and address your concerns. We will then give you a quote for performing the necessary tree services and schedule a time for our team to come back. Our quote includes felling of the tree, cutting and stacking or removing the wood, as well as a thorough clean up. Naturally, during a tree removal service, heavy equipment is generally used because it is specifically designed to streamline the process. Our equipment makes those larger jobs safer, more effective, and more efficient. However, we often have customers who prefer that we use only climbing gear and no heavy machinery, as there is always potential for landscape damage. Please let us know ahead of time and we are happy to accommodate. Throughout the removal service, there will be a ground crew constantly clearing the work area of debris and ensuring proper safety measures are being taken. * #1 Tree Service 11 Years in a Row! Tree trimming (and pruning) is an incredibly important part of caring for your trees. Every year in Tennessee, more trees die from improper trimming than from pests and disease combined. To the untrained eye, trimming a tree may seem like a simple task but it is actually a science, which should only be done by an experienced arborist. Every tree is unique, from its roots to its highest branches, and should be treated as an individual. Any and all cuts must be made at the right time and in the right location; otherwise, the tree may suffer irreversible damage. On the other hand, when performed by a trained professional, regular trimming of your trees will lead to new growth, improved health, and a more beautiful landscape. We have three intentions for a trimming service: to remove dead or dying limbs, to assess and improve the tree’s health, and to improve upon the natural aesthetic and beauty of the tree. Similar to our removal services, a team member will come to your home or business for an assessment and provide you with a suggested course of action, as well as a quote for the recommended tree services. We will then work with you to schedule a date and time to perform the trimming. Our heavy duty tree trimming equipment allows us to tackle even the biggest jobs safely and efficiently. However, the use of such equipment does come with the risk of damage to the landscape. If you would like us to use only climbing harnesses to do the trimming, please let us know. We understand that most people have preferences, as to how their trees look and fit into their landscape. At any point, please feel free to guide our efforts - we want you to be 100% satisfied with our work. However, if your suggestions may lead to over cutting or otherwise harming of the tree, we must suggest an alternative solution. Give us a call today to improve your home or business’ curb appeal, as well as the health of your trees! After we perform a removal service, let us get rid of that useless stump. Besides being unattractive, a tree stump can be a true nuisance and removing it can be a difficult and dirty job. Whether it has become a hazard for guests, a home for insects, or just an unintentional yard ornament, it needs to go so that you can enjoy your property once again. With our state of the art grinders, our team of tree professionals can eliminate any size stump from any location, safely and without negatively affecting your landscape. Stump removal is not a fun project for any home or business owner and can be dangerous. We know you have better things to do with your time so ask us to remove that unsightly stump for you. Strong storms can cause unexpected damage to the trees on your property at any time of day so we are here for you 24x7. 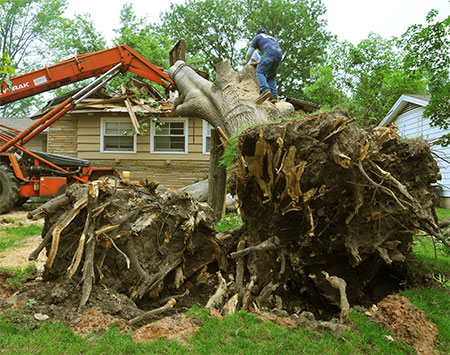 When powerful winds and torrential rain cause limbs to break or trees to fall into your home, call us and we will be there quickly, ready to restore your landscape. Tree damage due to a storm can cause a dangerous, potentially deadly, situation so it is imperative to call the team you can trust. We are the tree service Chattanooga trusts in an emergency so don’t call just anyone - allow us to protect you and your trees. We will clear brush from any size property and our team has performed brush removal services for every situation, from small backyards to large farms. If brush and debris have taken over your property, give us a call and allow us to get rid of it so you can utilize every inch of your land. We have found that the most efficient way to eliminate brush is by turning it into wood chips, which can then be used as mulch or firewood. Don’t let your yard turn into storage for dead limbs - get in touch with us today and we will do the rest.